Home > FAQs > What types of wood can I burn on a woodburner? CAN I BURN PINE / CONIFER / WILLOW / POPLAR / SOFTWOOD ON MY WOODBURNER? Yes, of course, as long as they are dry. You may have heard that these types of wood cause “tar” or “sap” problems in chimneys but it’s just not true. They are less dense and so you’ll need to use around 25% more softwood to get the same heat output as hardwood. A kilo of softwood will give about the same heat energy as a kilo of hardwood. These woods are not so suitable for open fires as they tend to spit and spark. Generally, seasoned wood is seen as the most environmentally-friendly fuel and therefore the one that is the most widely-recommended. However, it’s important to use only dry wood, which should contain 20% moisture or less. Logs should not be too large – 5 inches wide (125mm) will give the best result. Using large logs to make the fire last longer will usually result in a lower burning temperature, more wasted fuel and more pollution. If you are buying for immediate use then look out for the ‘Ready to Burn’ logo for reassurance that the logs you are purchasing are dry enough to be ready to burn. Stack logs so the air can get at them. If you cut and split them yourself try to do this when the wood is fresh cut as it is much easier on you and your tools. Once split, you have greatly increased the surface area of each piece and it will dry much faster. Logs need to be properly stacked, not heaped in a pile. A well ventilated log store with open sides and a roof on it is the best situation. 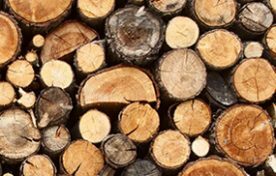 You should easily be able to achieve moisture content of 20% or less in 6 to 12 months if your logs are the right size and properly stored. Beware of the word seasoned, it means nothing in reality. The only important consideration is the moisture content. A moisture meter is a very useful tool. To test the moisture content of any log, split it first and then test the split surface.